Pin-track infections are a common problem with external fixation and any other implant that breaks the skin barrier. The literature is rich with reports and techniques for treating these infections, but lacks a universally accepted definition of a pin track infection, a single commonly accepted classification, or a standard method of reporting. However, the surgeon can follow a commonly accepted series of practical steps to reduce the occurrence of infection. Continuing development of improved surfaces, substances, and techniques may make pin track infections rarer in the future. Careful preoperative planning, meticulous surgical technique, patient education, and close patient monitoring are all critical to minimize pin-track infections. Pin-track infections continue to be a common problem with external fixation. While pin-track infections are usually associated with external fixators, any metallic implant that violates the skin barrier is at risk for developing a pin-track infection. This includes traction pins, Kirschner wires, and halo pins as well as external fixator pins. Tosti et al. recently reported a 1.4% smooth wire infection rate for Kirschner wires used in pediatric orthopedic surgery. Iobst and Liu reviewed the external fixation literature from 1980 to 2014 and found an overall 27.4% risk of pin-track infection. Not only are pin-track infections frequent but also they can become dangerous. Jauregui et al. identified eight cases of toxic shock syndrome or necrotizing fasciitis causing life- and limb-threatening infections following the use of an external fixator. This review will discuss the orthopedic literature on pin-track infections, recommend practical steps to decrease pin-track infections, and present future directions for preventing pin-track infections. There are hundreds of articles in the orthopedic literature that discuss external fixator pin-track infections. However, the comparison of results by different studies is problematic. Depending on the study, the published infections rates may range from 0% to 100%. This variation most likely represents how the infection is defined and measured rather than a true difference in infection rates. Because there is not a universally accepted definition of a pin track infection or a standardized classification, an objective determination and quantification of these infections is challenging. In their review, Lethaby et al. described the existing literature as very heterogeneous and generally of poor quality. Furthermore, they found insufficient evidence in the literature to identify a strategy of pin site care that minimizes pin-track infection rates. There are several layers to this issue. First, there is no uniform definition of what constitutes a pin-track infection. Depending on the reference, any of the following variables have been used to diagnose a pin-track infection: erythema, erythema plus purulent drainage, positive microbiology, response to antibiotics, or requiring the removal of the offending pin or wire. Consequently, the results of any previously published studies are weakened by this continued discord. Standardizing the definition of a true pin-track infection is a fundamental requirement to any future research in this area. Until clinicians can agree on how to identify a pin-track infection, there will be limited value in pursuing further investigation of this topic. Second, there are multiple different classification used to classify pin track infections. There are systems based on the degree of infection (Paley, Dahl, Checketts-Otterburn, and Saw), systems based on response to treatment (Saleh), and simplified systems such as major/minor (Ward), calm, irritated, and infected (Santy), and good, bad, and ugly (Clint).,,,,,,, The existence of multiple classifications implies that there is no universally accepted system that satisfies all surgeons. Not only are there different classifications but also they are based on different criteria (degree of infection, response to treatment, etc.,) which makes them fundamentally different. Finally, none of the classification systems has been empirically developed or tested for their reliability or validity. We need to develop a universally accepted pin track infection classification before any further research can improve on this topic. Third, there is not a standard method of reporting pin-track infections in the literature. Some authors record pin-track infections per patient. Consequently, if a pin-track infection develops at any point during the course of treatment, then the patient is considered to be infected. The drawback of this method is that it does not differentiate between infection at a single pin site or multiple pin sites within one patient. The other common method of reporting pin-track infections is per pin site. This method more accurately portrays the number of pin site infections because it uses the total number of pin/wire sites within the study group as the denominator rather the number of patients. However, both of these methods share the same shortcoming – how to deal with repeat infection at the same pin site. If a pin site infection clears with treatment but recurs several weeks later, does that count as two separate infections or it is still just one? There is no clear guideline for how to handle this circumstance. Finally, there is not even agreement among clinicians regarding what to call pin-track infections. A January 2017 search of the PubMed database reveals 202 articles with “pin track” in the title and 459 articles with “pin tract” in the title. According to dictionary.com, the definition of a track is a course or route followed. The definition of a tract is an expanse or area of land, water, etc., While this is an exercise in semantics, it is important that everyone agrees on the proper name of this clinical entity. Based on the dictionary definition, it would seem that pin-track infection is more appropriate in this setting and should be used moving forward. The pin-track literature is replete with articles testing the efficacy of different pin care regimens. For example, there are studies attempting to determine the optimal cleansing solution, the most effective dressing type, or the ideal frequency of cleaning.,,,,,,,,, Unfortunately, these studies are examining groups of patients with multiple different variables [Table 1], and it is impossible to determine if any improvement in care is directly related to the cleansing solution or dressing type. Even within a single patient's frame construct, not all of the pins and wires are equally at risk for developing an infection [Figure 1]. A diaphyseal tibial medial-face half pin would not be expected to have the same risk of pin-track infection as a juxta-articular wire. Because the diaphyseal tibial pin has a low expected risk of infection, outcome data from this pin site are less clinically valuable than if a study could show improved outcomes for pins/wires that are at an increased risk of infection such as periarticular wires. 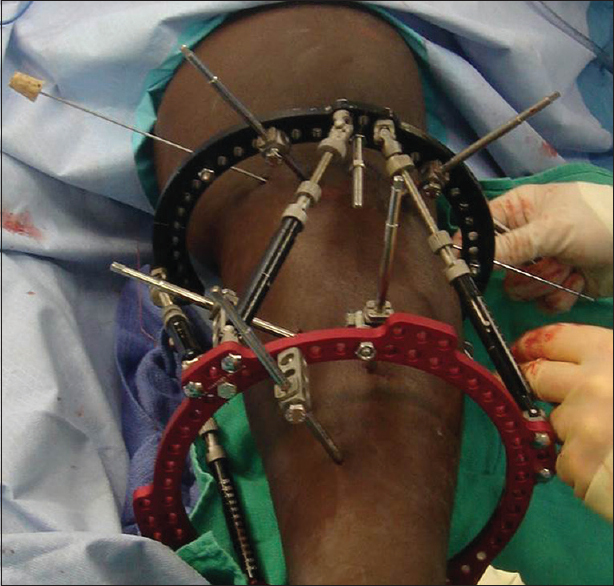 Figure 1: This hexapod circular external fixator on a patient's tibia represents a common scenario in which each of the half pins and wires has different risks of infection. The periarticular wire (red arrow) has a higher risk of infection than the diaphyseal tibial half pin (white arrow). Therefore, each pin or wire in a particular external fixator should be considered an independent entity whose pin-bone and pin-skin interface health is determined by a host of factors that begin the moment the pin-skin barrier is breached in the operating room. To create studies that have valid results, all of the variables would have to be controlled except for one being investigated. Otherwise, it is difficult to determine whether any change in outcome is directly related to the variable in question. For studies with external fixation, this is very difficult to do given the multitude of variables that exist. The alternative is to design a system that assigns a standardized score to each pin or wire at the time of insertion based on the variables directly affecting it. This scoring system would provide a method to homogenize the multitude of external fixation variables and allow clinicians to objectively compare outcomes for similar pin/wire sites. Preliminary work is being done on developing such a scoring system, but there is currently no system in place for clinicians to use. Pin care begins before the patient enters the operating room. The overall health of the patient's soft tissue envelope should be assessed preoperatively. A plan for anticipated pin and wire placement can be performed to avoid areas of concern such as previous incisions, open wounds, muscle flaps, or the zone of injury. The quality of the bone must also be evaluated. Review of orthogonal radiographs will determine whether to use pins or wires (dysplastic bone may require a frame using just wires) and what size half pins are necessary (length and diameter). Stress on the pin-bone interface can be reduced using the appropriate external fixator type and building a stable frame construct. Preplanning the number and position of the half pins/wires to be inserted will help to ensure that proper frame biomechanics are present at each pin-bone interface. An unstable frame will increase the stress at each individual pin-bone interface which can lead to loosening, inflammation, and eventually infection. Once in the operating room, meticulous surgical technique is mandatory. Atraumatic insertion of the pin or wire through the skin, soft tissue envelope, and bone is the goal. Skin incisions can be placed to anticipate the direction of skin travel. The incision should be large enough to avoid tension on the skin without leaving a large open wound around the pin or wire. Rapid healing of the pin-skin interface is desirable to create a seal from the external environment. It is important to manipulate the limb through a full range of motion at the end of the surgery to identify and release any areas of skin tension. The pin-bone interface can be optimized by avoiding the generation of heat during the insertion process. Wires should be inserted using a sponge soaked in alcohol to cool and disinfect the wire during drilling. The wire should be pushed through the soft tissues to the near cortex and then tapped through the soft tissues after penetrating the far cortex. Half pins should be predrilled and inserted by hand. The following tips while drilling are important to avoid heat: (1) use sharp drill bits, (2) avoid cannulated drills whenever possible, (3) low-speed, pulsatile drilling rather than continuous drilling on high speed, (4) irrigating while drilling, (5) avoid unicortical pin placement, and (6) do not drill while using a tourniquet. Using half pins with coatings that promote osteointegration, such as hydroxyapatite, indirectly decreases the risk of infection. The pin site should be irrigated after insertion to remove any particles of bone in the surrounding soft tissue after drilling. Pin sites should be immediately covered and compressed with sterile dressings/sponges after insertion to absorb any blood. The dressing will also prevent skin tenting or hematoma formation. These dressings can be changed at the end of the procedure if they are soaked with blood. Certain half pin/wire locations, such as the periarticular region, will have increased soft tissue movement around the half pin or wire which can lead to increased irritation at the site. Stabilizing the skin with a sponge or gauze will limit the amount of motion at these sites. Patient education is another critical element to decreasing the risk of pin-track infection. The more knowledgeable the patient or patient's caregivers are regarding pin site care, the better they will be at identifying problems early. The patient should be taught that new onset pain at a particular pin/wire site may be the first sign of an impending pin-track infection. The patient should also be reminded to keep the limb elevated at all times except for range of motion exercises or walking. Elevation will reduce edema around the pins and promote more rapid healing of the pin tracks. A prophylactic antibiotic prescription should be provided to the patient, so treatment of any suspected pin-track infection can begin as soon as it is recognized. Finally, the surgeon needs to maintain close observation of the patient with frequent clinical follow-up. Weekly monitoring of the pin sites by the surgical team in clinic will allow experienced personnel to evaluate the care of the sites and reinforce the desired cleaning regimen. Because pin-track infections continue to plague patients with external fixation, new strategies to minimize the risk of infection are being investigated. One strategy is to improve the osteointegration rate of the pin-bone interface by applying a coating to the external fixator pin. This accelerated osteointegration indirectly reduces the risk of bacterial infection rate by lowering rates of osteolysis and pin loosening. For the past two decades, hydroxyapatite coatings have been used to increase the stability of the pin-bone interface. Newer methods involving tantalum and bisphosphonates have been described. Unnithan et al. coated stainless steel external fixator screws with tantalum and found significantly improved osseointegration compared to controls. Bisphosphonates inhibit osteoclast bone resorption which promotes net bone deposition. Toksvig-Larsen and Aspenbergfound that a bisphosphonate coating was comparable to that of hydroxyapatite coatings in providing metaphyseal fixation. While the bisphosphonate coating results are encouraging, it may actually be more beneficial when it is used intravenously. Harding et al. reported that a single infusion of zoledronic acid improved twofold the fixation of noncoated half pins in diaphyseal bone. While much of the research focus has been on improving the pin-bone interface, the pin-skin interface may be equally important in preventing infection. Accelerating the closure of the pin-skin interface could reduce the risk of infection by sealing the interface from bacterial invasion. Jeyapalina et al. applied a porous-structured subdermal barrier to a titanium implant. In an animal model, clinical, microbiological, and histopathological data showed that the porous titanium barrier prevented superficial and deep tissue infections compared to controls with smooth titanium implants. Peramo et al. found fixator pins in vitro induce apoptosis and hyperproliferation in the tissues in the areas close to the pins. However, when the skin specimens were treated with a hyaluronic acid and dermatan sulfate mixture, there was a moderate reduction of apoptosis and proliferation. This may improve wound healing around the fixator pin by maintaining a better epidermal architecture and promoting tissue regeneration. Immediately after insertion of the wire or half pin into the patient, plasma proteins rapidly coat the surface. A “race for the surface” then begins between osteogenic cells and bacteria that will determine the fate of the implant. If the osteogenic cells populate the half pin/wire surface before the bacteria, then the bacteria will die off, and no infection will occur. One strategy, therefore, is to modify the morphology of the surface of the half pin/wire to prevent bacterial adhesion and promote osteogenic cell adhesion. Since much of the natural environment surrounding osteoblasts and osteoclasts consists of structures with nano-scale topography, changes to the pin/wire surface at the nano-scale level have been investigated. The surface topographies of titanium, for instance, can obtain such a degree of complexity that they actually confer new properties to the material surface. Using techniques such as electron beam evaporation, the nanostructure of the surface of a titanium implant can be changed to reduce the area available for bacterial attachment. Puckett et al. demonstrated decreased adhesion of Staphylococcus aureus, Staphylococcus epidermidis, and Pseudomonas aeruginosa on nanorough titanium surfaces created through electron beam evaporation compared with conventional titanium. It may also be possible to manipulate biological processes by modifying the nanotopography of titanium. Nanotechnology research has shown that osteoblast proliferation and osteoblast gene expression can be influenced by changing the surface topography of titanium. Continued research in this field may eventually design a half pin or wire that resists bacterial adhesion and promotes osteointegration simply by modifying the surface nanotopography of the implant. This would eliminate the current need to rely on antibiotics or chemical agents to fight pin-track infections. Figure 2: Scanning electron microscopic images of titanium nanotubes. Top view of nanotubular surface (a) high magnification top view of nanotubular surface (b) showing the tube diameter of approximately 80 nm. Reprinted from Popat, et al. The surface of half pins or wires can also be modified to prevent bacterial adhesion using unique coatings. One such coating uses electrostatic interaction to prevent bacteria from binding to titanium. Quaternized chitosan can be covalently bound to the surface of titanium which creates an electrostatic repulsion effect on bacterial cells with similarly charged glycocalyx. Peng et al. found quaternized chitosan provides a self-protective surface that prevents bacterial colonization and implant-associated infections as revealed by radiographs, blood and bone culture, and histological analyses. Similar to the nanotechnology investigations, this technique is attractive as a potential method to decrease infections without relying on antibiotics or chemical agents. Other bioactive antibacterial coatings have been investigated. Nitric oxide is a compound known to be bactericidal to both Gram-positive and negative bacteria and prevents bacterial adhesion. However, nitric oxide is also very unstable. Holt et al. stabilized nitric oxide by combining it with a xerogel film. After applying the coating to titanium external fixator pins, they found the nitric oxide releasing xerogel coatings inhibited bacterial colonization both during the initial postsurgical period and up to 48 days postimplantation. Similarly, Qu et al. developed a biocompatible, nanostructured silica sol-gel that can release bactericidals in a controlled fashion for weeks. They reported their results using external fixator pins coated with micron-thin sol-gel releasing triclosan and inserted medially into rabbit tibiae. Rabbits receiving triclosan/sol-gel-coated percutaneous pins did not show signs of infection while uncoated percutaneous pins had a significantly higher infection rate. Coatings can also be designed to have different layers, with each layer having a different function. For example, Carvalho et al. investigated creating thin layer-by-layer films combining the adhesive properties of a hyaluronic acid–dopamine conjugate with the bioactivity and bactericidal properties of silver nanoparticles. Initial in vitro studies exhibited antibacterial effect against S. aureus and Escherichia More Details coli cultures. Modification of the standard hydroxyapatite coating to include antibacterial properties has also been investigated. Dejong et al. used a lipid stabilized hydroxyapatite/chlorhexidine complex coating on external fixation pins in a goat model. They found infection to S. aureus developed in 100% of the uncoated pins compared to only 4.2% of the pins coated with the hydroxyapatite/chlorhexidine complex. Sörensen et al. studied the antibacterial properties of tobramycin loaded hydroxyapatite coated fixation pins. They found a sustained drug release of tobramycin above the minimal inhibitory concentration value for S. aureus for 8 days. The coating also appeared to be biocompatible, as it did not have any obvious effect on the cellular viability of endothelial cells or osteoblasts. Attempts to create external fixator pins or wires that incorporate intrinsically antibacterial substances have also been developed. In one of the few experimental studies that has actual clinical data, Shirai et al. report their results of iodine-supported titanium half pins and wires [Figure 3]. After developing a technique to coat titanium implant surfaces with iodine, 476 pin insertion sites were evaluated in 39 limbs of 38 patients. With an average external fixation duration of 6 months, they reported Grade 1 infections in 2.5% of patients, Grade 2 infections in 1.1% of patients, and no infections Grade 3 or higher based on the Checketts-Otterburn classification. In addition, no abnormalities of the thyroid gland function were detected, and approximately 40% of the iodine remained on the implant after 1 year. Selenium in the form of sodium selenite can also be used for antimicrobial coating of titanium implants. In vitro, Holinka et al. found a reduced S. aureus and S. epidermidis attachment combined with excellent biocompatibility without cytotoxicity using this coating. Selenium and iodine-supported titanium represent two promising antibacterial methods to reduce pin-track infections. Figure 3: Iodine-supported titanium wires (a) and half pins (b). Reprinted from Shirai et al. The last category contains three miscellaneous techniques designed to decrease the risk of infection using unique methods. The first uses photoactivation of titanium dioxide-coated external fixation pins. Titanium oxide attains antimicrobial properties after irradiation by ultraviolet light. Koseki et al. found that infection was inhibited both clinically and histomorphometrically at the insertion site using titanium dioxide-coated external fixator pins compared with untreated stainless steel control pins. While the feasibility of treating patients with ultraviolet light remains in question, this represents another possible method of reducing infection without the use of antibiotics. The second method uses electrical stimulation to obtain a bactericidal effect. van der Borden et al. reported their results in preventing pin-track infection in goats using electric current with a stainless steel external fixator frame. They reported that a 100 μA DC treatment was observed to prevent signs of clinical infection around stainless steel percutaneous pins implanted in the tibia of goats, with no adverse side effects being reported. Similarly, Ercan et al. found that electrical stimulation worked synergistically with anodization of titanium to reduce S. aureus biofilm formation. Based on these reports, perhaps applying an electrical current to infected implants in combination with antibiotic therapy could be successful treatment combination in the future. Finally, rather than directly counteract bacterial colonization using antibiotics or chemical agents, a strengthening of the body's local immune response could provide an effective method of preventing infection. The cytokine interleukin (IL-12) is known to induce T helper cells to secrete cytokines which stimulate the bactericidal activity of macrophages. Li et al. developed a technique to treat stainless steel Kirschner wires with a polypeptide multilayer nanoscale coating loaded with IL-12. They found a substantially decreased rate of S. aureus infections when these wires were used in an animal model. With the ever-growing challenge of antibiotic resistance, this type of nanoscale coating is an innovative approach to solving the recurrent clinical dilemma of pin-track infections. The previous literature on pin-track infections is difficult to interpret given the multitude of variables that need to be controlled. Research on standardizing the risk of infection for each half pin or wire at the time of insertion is still necessary. There are details within the surgeon's control that can be used to help reduce the risk of developing pin-track infections. Meticulous preoperative planning and surgical technique are mandatory. Finally, there are many new and exciting investigations under way to develop half pins and wires that are more resistant to bacterial infection. While many ideas are still in the investigational stages, a few, such as iodine-supported titanium, are already being used in clinical trials with good results. In summary, multiple efforts are underway in an effort to create a half pin or wire design that will help to decrease the risk of pin-track infections. The core principles of external fixation universally apply to all surgeons, regardless of whether they have access to software-driven frames with hydroxyapatite-coated pins. Careful preoperative planning, meticulous surgical technique, patient education, and close patient monitoring are all critical to minimizing pin-track infections. Christopher Iobst is an educational consultant for Nuvasive, Orthofix, and on the speaker's bureau for Smith and Nephew. Tosti R, Foroohar A, Pizzutillo PD, Herman MJ. Kirschner wire infections in pediatric orthopaedic surgery. J Pediatr Orthop 2015;35:69-73. Iobst CA, Liu RW. Systematic review of incidence of pin track infections associated with external fixation. J Limb Lengthen Reconstr 2016;2:6-16. Jauregui JJ, Bor N, Thakral R, Standard SC, Paley D, Herzenberg JE, et al. Life- and limb-threatening infections following the use of an external fixator. Bone Joint J 2015;97-B: 1296-300. Lethaby A, Temple J, Santy-Tomlinson J. Pin site care for preventing infections associated with external bone fixators and pins. Cochrane Database Syst Rev 2013;12:CD004551. Checketts RG, MacEachern AG, Otterburn M. Pintrack infection and the principles of pin site care. In: DeBastiani GA, Apley G, Goldberg A, editors. Orthofix External Fixation in Trauma and Orthopaedics. London: Springer; 2000. Saw A, Chan CK, Penafort R, Sengupta S. A simple practical protocol for care of metal-skin interface of external fixation. Med J Malaysia 2006;61 Suppl A:62-5. Saleh M, Scott BW. Pitfalls and complications in leg lengthening: The Sheffield experience. Semin Orthop 1992;7:207-22. Ward P. Care of skeletal pins: A literature review. Nurs Stand 1998;12:34-8. Santy J, Vincent M, Duffield B. The principles of caring for patients with ilizarov external fixation. Nurs Stand 2009;23:50-5. Clint SA, Eastwood DM, Chasseaud M, Calder PR, Marsh DR. The “Good, bad and ugly” pin site grading system: A reliable and memorable method for documenting and monitoring ring fixator pin sites. Injury 2010;41:147-50. Henry C. Pin Sites: Do we need to clean them? Pract Nurs 1996;7:12-7. W-Dahl A, Toksvig-Larsen S. Pin site care in external fixation sodium chloride or chlorhexidine solution as a cleansing agent. Arch Orthop Trauma Surg 2004;124:555-8. Egol KA, Paksima N, Puopolo S, Klugman J, Hiebert R, Koval KJ, et al. Treatment of external fixation pins about the wrist: A prospective, randomized trial. J Bone Joint Surg Am 2006;88:349-54. Camilo AM, Bongiovanni JC. Evaluation of effectiveness of 10% polyvinylpyrrolidone-iodine solution against infections in wire and pin holes for ilizarov external fixators. Sao Paulo Med J 2005;123:58-61. Grant S, Kerr D, Wallis M, Pitchford D. Comparison of povidone-iodine solution and soft white paraffin ointment in the management of skeletal pin-sites: A pilot study. J Orthop Nurs 2005;9:218-25. Yuenyongviwat V, Tangtrakulwanich B. Prevalence of pin-site infection: The comparison between silver sulfadiazine and dry dressing among open tibial fracture patients. J Med Assoc Thai 2011;94:566-9. Lee CK, Chua YP, Saw A. Antimicrobial gauze as a dressing reduces pin site infection: A randomized controlled trial. Clin Orthop Relat Res 2012;470:610-5. Gordon JE, Kelly-Hahn J, Carpenter CJ, Schoenecker PL. 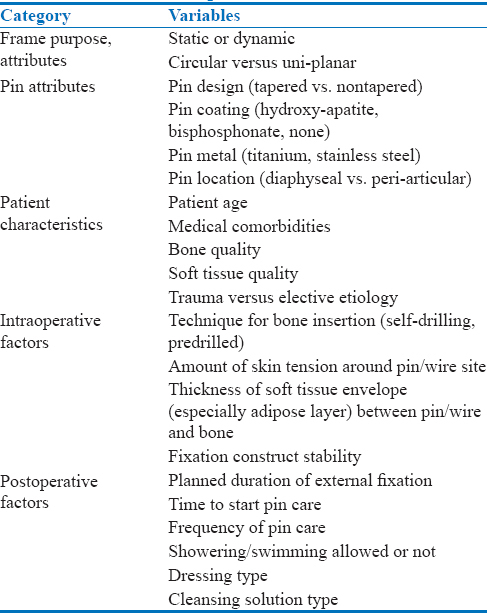 Pin site care during external fixation in children: Results of a nihilistic approach. J Pediatr Orthop 2000;20:163-5. Parameswaran AD, Roberts CS, Seligson D, Voor M. Pin tract infection with contemporary external fixation: How much of a problem? J Orthop Trauma 2003;17:503-7. Cavusoglu AT, Er MS, Inal S, Ozsoy MH, Dincel VE, Sakaogullari A, et al. Pin site care during circular external fixation using two different protocols. J Orthop Trauma 2009;23:724-30. Moroni A, Aspenberg P, Toksvig-Larsen S, Falzarano G, Giannini S. Enhanced fixation with hydroxyapatite coated pins. Clin Orthop Relat Res 1998;346:171-7. Unnithan A, Wells R, Goodship A, Ghani Y, Blunn G. A Comparison of Coating Methods to Improve Osseointegration of External Fixator Screws. 53rd Annual Meeting of the Orthopaedic Research Society. San Diego, CA; 11-14 February, 2007. Toksvig-Larsen S, Aspenberg P. Bisphosphonate-coated external fixation pins appear similar to hydroxyapatite-coated pins in the tibial metaphysis and to uncoated pins in the shaft: A randomized trial. Acta Orthop 2013;84:314-8. Harding AK, Toksvig-Larsen S, Tägil M, W-Dahl A. A single dose zoledronic acid enhances pin fixation in high tibial osteotomy using the hemicallotasis technique. A double-blind placebo controlled randomized study in 46 patients. Bone 2010;46:649-54. Jeyapalina S, Beck JP, Bachus KN, Williams DL, Bloebaum RD. Efficacy of a porous-structured titanium subdermal barrier for preventing infection in percutaneous osseointegrated prostheses. J Orthop Res 2012;30:1304-11. Peramo A, Marcelo CL, Goldstein SA, Martin DC. Improved preservation of the tissue surrounding percutaneous devices by hyaluronic acid and dermatan sulfate in a human skin explant model. Ann Biomed Eng 2010;38:1098-110. Puckett SD, Taylor E, Raimondo T, Webster TJ. The relationship between the nanostructure of titanium surfaces and bacterial attachment. Biomaterials 2010;31:706-13. Durmus NG, Webster TJ. Nanostructured titanium: The ideal material for improving orthopedic implant efficacy? Nanomedicine (Lond) 2012;7:791-3. Popat KC, Eltgroth M, Latempa TJ, Grimes CA, Desai TA. Decreased Staphylococcus epidermis adhesion and increased osteoblast functionality on antibiotic-loaded titania nanotubes. Biomaterials 2007;28:4880-8. Peng Z, Ao H, Wang L, Guao S, Tang T. Quaternized chitosan coating on titanium provides a self-protective surface that prevents bacterial colonisation and implant-associated infections. RSC Adv 2015;5:54304-11. Holt J, Hertzberg B, Weinhold P, Storm W, Schoenfisch M, Dahners L, et al. Decreasing bacterial colonization of external fixation pins through nitric oxide release coatings. J Orthop Trauma 2011;25:432-7. Qu H, Knabe C, Burke M, Radin S, Garino J, Schaer T, et al. Bactericidal micron-thin sol-gel films prevent pin tract and periprosthetic infection. Mil Med 2014;179:29-33. Carvalho AL, Vale AC, Sousa MP, Barbosa AM, Torrado E, Mano JF, et al. Antibacterial bioadhesive layer-by-layer coatings for orthopedic applications. J Mater Chem B 2016;4:5385-93. DeJong ES, DeBerardino TM, Brooks DE, Nelson BJ, Campbell AA, Bottoni CR, et al. Antimicrobial efficacy of external fixator pins coated with a lipid stabilized hydroxyapatite/chlorhexidine complex to prevent pin tract infection in a goat model. J Trauma 2001;50:1008-14. Sörensen JH, Lilja M, Sörensen TC, Šstrand M, Procter P, Fuchs S, et al. Biomechanical and antibacterial properties of tobramycin loaded hydroxyapatite coated fixation pins. J Biomed Mater Res B Appl Biomater 2014;102:1381-92. Shirai T, Watanabe K, Matsubara H, Nomura I, Fujiwara H, Arai Y, et al. Prevention of pin tract infection with iodine-supported titanium pins. J Orthop Sci 2014;19:598-602. Holinka J, Pilz M, Kubista B, Presterl E, Windhager R. Effects of selenium coating of orthopaedic implant surfaces on bacterial adherence and osteoblastic cell growth. Bone Joint J 2013;95-B: 678-82. Koseki H, Asahara T, Shida T, Yoda I, Horiuchi H, Baba K, et al. Clinical and histomorphometrical study on titanium dioxide-coated external fixation pins. Int J Nanomedicine 2013;8:593-9.
van der Borden AJ, Maathuis PG, Engels E, Rakhorst G, van der Mei HC, Busscher HJ, et al. Prevention of pin tract infection in external stainless steel fixator frames using electric current in a goat model. Biomaterials 2007;28:2122-6. Ercan B, Kummer KM, Tarquinio KM, Webster TJ. Decreased Staphylococcus aureus biofilm growth on anodized nanotubular titanium and the effect of electrical stimulation. Acta Biomater 2011;7:3003-12. Li B, Jiang B, Boyce BM, Lindsey BA. Multilayer polypeptide nanoscale coatings incorporating IL-12 for the prevention of biomedical device-associated infections. Biomaterials 2009;30:2552-8.